Array Day at the Greek Fest! What’s not to love about a plate full of authentic gyros, souvlaki and baklava? 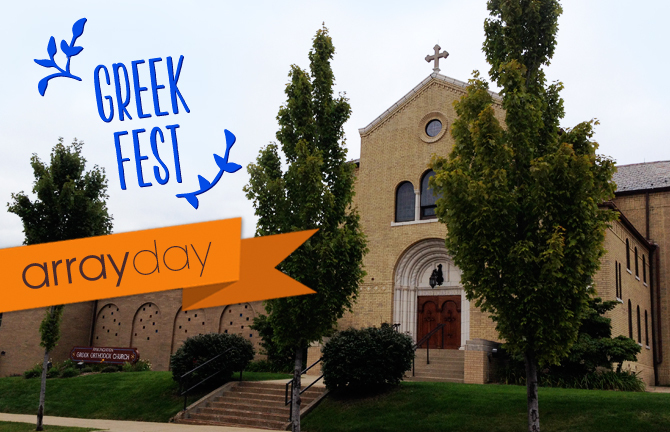 Last week, the Array team visited the 56th annual Greek Festival at Annunciation Greek Orthodox Church on Union Street in Akron. Churchgoers say the festival is about a lot more than great food. The celebration also included Greek music and dancing, church tours and a plethora of treasures to be found in the Attic Tag Sale. Needless to say, we all found a few things to take home that day! The festival, “is a way you can see the entire life of the church … the entire life of someone who is Orthodox – the food, the family, the culture, the faith,” said the Reverend Andrew Lentz. What a fantastic way to get out into our community, meet people and enjoy great culture. I’m already looking forward to next year’s ice cream and baklava sundaes!